Chinese is written in two different varieties of characters: Traditional and Simplified. The characters in Traditional Chinese are often more intricate composed of many strokes; while the characters in Simplified Chinese uses forms which have been reduced to fewer strokes. Beyond the graphical contrasts of the two characters, they are used in different areas and by different Chinese speakers. Simplified Chinese characters are officially used in Mainland China, Singapore and Malaysia, and used in some overseas Chinese communities. Traditional Chinese characters are officially used in Taiwan, HongKong and Macau, and used by many Overseas Chinese communities. Most common font styles are Song, Fang Song, Kai, Hei, Li and Wei. Hei is a popular font that pairs well with Helvetica. 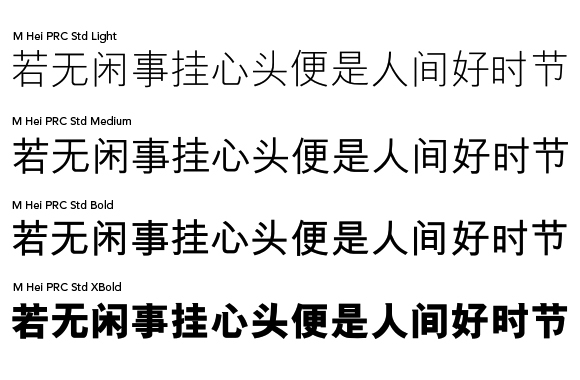 View more Simplified Chinese fonts – Click here. View more Traditional Chinese fonts – Click here. This entry was posted in Chinese Fonts and tagged alt.TYPE, alttype, C Wei Bei, Chinatype, Chinese, chinese calligraphy fonts, Chinese Characters, Chinese Fonts, Chinese language Fonts, chinese style fonts, Chinese Typeface, Hei, Japanese, Korean, Linotype, M Gentle, M Hei, M Kai, M Sung, MHei, Monotype, MSung, Simplified Chinese, singapore, Unicode Chinese Fonts, Vietnamese fonts on October 4, 2012 by alt.TYPE.